A LORRY driver who killed another motorist by drifting off the A9 and smashing into his parked car in a lay-by has been allowed to walk free from court. John Trimble was sitting in his car when Frank Simpson’s 18-ton lorry veered off the road at 50 miles per hour and crashed into the rear of his Vauxhall Corsa. Simpson - who would have seen the parked car for 32 seconds before the catastrophic impact - failed to brake at all until two seconds after ramming into Mr Trimble’s vehicle. At Perth Sheriff Court, Sheriff William Wood said the driving did not amount to “dangerous” and was in the mid-range of careless driving. Sheriff Wood said: “It’s certainly nowhere near dangerous driving, yet it’s not simply momentary inattention, because there was 32 seconds where he should have seen the vehicle. “These are serious matters. You caused the death of a man who was in the prime of his family life. This was a man with very close relationships to his three daughters and son, and a wife and grandchildren. Simpson was ordered to carry out 300 hours unpaid work as an alternative to custody and placed on a six month curfew between 7 pm and 7 am each day. He was banned from driving for 30 months and ordered to re-sit the extended driving test. Simpson was driving a refrigerated HGV for DHL and heading to the Vue Cinema in Inverness when the accident happened on 4 November 2014. Fiscal depute Sue Ruta told the court: “The accused was employed via an agency for DHL supply chain in Livingston. He had been driving for the company since 15 May 2014. “Mr Trimble was employed as a driver for Vital Pet Products in Cumbernauld. He had left home early in a hire car to pick up and return a vehicle for repair. “The collision occurred within lay-by 33 on the northbound section of the dual carriageway. At 7.50 am Mr Trimble was parked in the lay-by and sitting in the driver’s seat wearing his seatbelt. “The accused was driving northbound at just under 50 miles per hour. A witness observed the accused’s lorry start to drift slowly to the left towards the entrance of the lay-by. “That witness had a clear view of the lorry and could see the car parked in the lay-by. He thought the lorry was going to hit the car because it did not slow down and the brake lights did not come on. A major medical team arrived at the scene, including an air ambulance, but Mr Trimble was declared dead at the scene. He had sustained severe head and chest injuries. Ms Ruta said the lorry’s tacograph showed it had gradually slowed down before the impact, but had only had the brakes applied two seconds after the vehicles collided. “There were no mechanical defects. The driver would have had a clear view of the lay-by for 32 seconds before impact. There is no evidence of the driver reacting to the vehicle leaving the carriageway or the imminent collision. 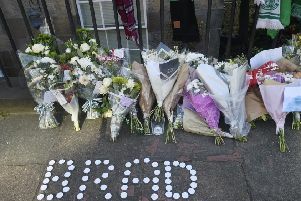 Simpson, 35, Sleigh Gardens, Edinburgh, admitted causing the death by careless driving of John Trimble in lay-by 33 of the A9 Perth to Inverness road on 4 November 2014. The court was told that Simpson offered no explanation for his loss of control. His solicitor Gary Foulis said: “He is truly and deeply remorseful for what’s happened here.